I’m sure Cyberlink never gets tired of hearing it, but I’ve gotten a bit bored continually calling out PowerDVD as the best of breed when it comes to PC video playback. And yes, that means I’m calling the latest version 18, despite a glitch or two, just that. If you’re not already a owner and want the best possible looking video playback, PowerDVD 18 is the real deal. With some material, especially older movies, its renderings are noticeably better than the very capable free solutions such as VLC, Media Player Classic - Home Cinema, Quicktime, Windows Media Player, et al. If you haven’t heard of PowerDVD, where have you been? It started from humble beginnings as a program that allowed you to play commercial DVD movies on your PC (when that was something everybody still wanted to do). It’s gradually blossomed into an extremely versatile media player that handles the vast majority of audio and video files in addition to the latest optical disc formats. 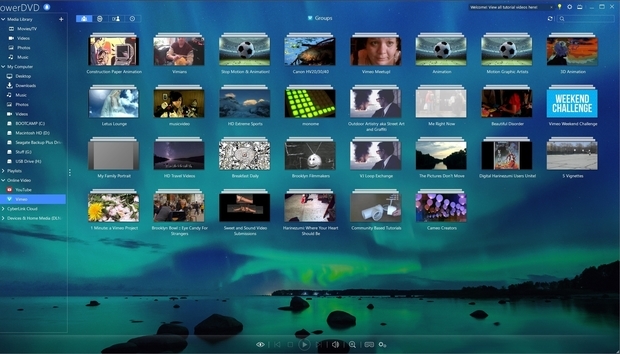 It also functions as a media librarian and online video viewer with direct connections to both YouTube and Vimeo. PowerDVD sports two interfaces: a simplified large-icon interface for use with a remote while you’re sitting on the couch, and another more complex and versatile interface that you can use with the mouse/keyboard from in front of your computer. PowerDVD 18’s alternate 10-foot interface for use on your TV with a remote. The list of file types and codecs that PowerDVD supports is impressive if not quite as universal as some of the free players. It can play everything from older AVI to h.265 and Ultra HD Blu-ray, MP3 to Apple and Windows Lossless, 3D, 360, and VR. You can see the full list here. There’s also DLNA streaming for home networks, and just about anything else you can think of pertaining to audio and video. Additionally, Cyberlink now has its own online storage service called CyberLink Cloud and 30GB of storage is free for the first year with purchase of the Ultra version. It’s free every year with the $45-per-year ($15 for three months) subscription version. Yes, PowerDVD 18 comes in several different flavors. The $100 Ultra is the full puppy with support for 2160p Ultra HD Blu-ray playback, while the $80 Pro version supports 1080p Blu-ray, and the $60 standard version is DVD only. PowerDVD Standard, does a bang-up job of playing DVDs. Note: The rest of your setup must be capable of handling the type of disc involved for PowerDVD to successfully play copy-protected movies. Obviously, this includes an optical drive that can play the disc, but it can get tricky beyond that, especially for Ultra HD Blu-ray, because everything in the display chain—from the drive to video card and the display it’s connected to—must support HDCP 2.2. You can use Cyberlink’s free Ultra HD Blu-ray Advisor to check your system (downloadable from here). Alas, Cyberlink asks for your name and email address, but it’s a direct download after you click, not a link mailed to you. A new “always on top” mini view is invoked as you reduce the window frame size, so you don’t have do deal with the PC controls every time you leave full-screen mode. Think movable PIP (Picture in Picture). I found it to be handy, but I wouldn’t consider it essential. The program now supports YouTube HDR & Live, as well as YouTube subtitling. Vimeo 360 video 360-degree photos are now rendered. If you haven’t seen 360 stuff, it’s quite cool. 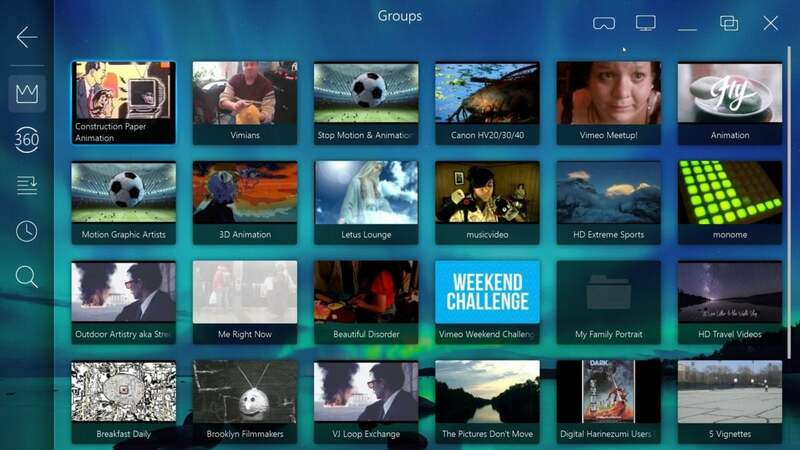 PowerDVD has supported 3D video since it came back in vogue. It’s passé again, but wait another 20 years—it’ll be back. New as well is Fire TV Stream Casting support, and a full-screen mode for Blu-ray on super-wide aspect ratio 21:9 TVs and displays. Cyberlink has also added support for those web videos you download from YouTube—at least those using the VP9/9.2 or Opus codecs. Alpha channel MOV files exported from Adobe Premiere can now be played. The alpha channel is to facilitate transparency, allowing you to easily remove or replace the background. Last, but not least for inexperienced users, is the new PowerDVD learning center, which is basically a nicely rendered help dialog with links to online videos. What can I say? Every time I review the latest version of PowerDVD, it stays installed when the review is over. Not a lot of software gets the same treatment. When I say not a lot, I mean basically nothing else. Though I use the freebies quite often, when I really care about picture quality, I fire up PowerDVD and its TrueTheater optimizations, which include (take a deep breath) TrueTheater Color (saturation enhancement), TrueTheater Sound (spatial and EQ enhancement), TrueTheater HD (upscaling for detail), TrueTheater Motion (reducing judder and the like), TrueTheater Lighting, TrueTheater Stretch (the 21:9 aspect ratio), TrueTheater Stabilizer (for shaky video), TrueTheater HDR (colors and contrast), and TrueTheater Denoise (for noisy video). 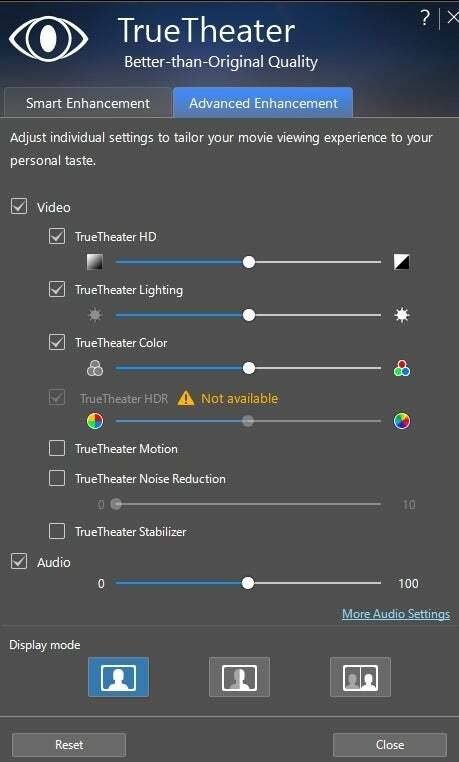 Those features can tax lesser computers, causing slow playback. If you encounter it on your system, just turn off one True feature at a time until your machine can handle the workload. PowerDVD’s TrueTheater enhancements rehabilitate and improve all but the most pristine video and audio. How effective or desirable any particular True feature is depends a lot on the quality of the material being processed, and not all enhancements are available with all material. If you own a brand-new 24-bit, recently mastered audio file, for example, the sound enhancement won’t help much. The same goes for an Ultra HD Blu-ray rip. If your output device doesn’t support 10-bit color, the software’s HDR option won’t be available. If you’re viewing older material, on the other hand, the color, lighting, de-noising, and especially the HD enhancements are very effective. 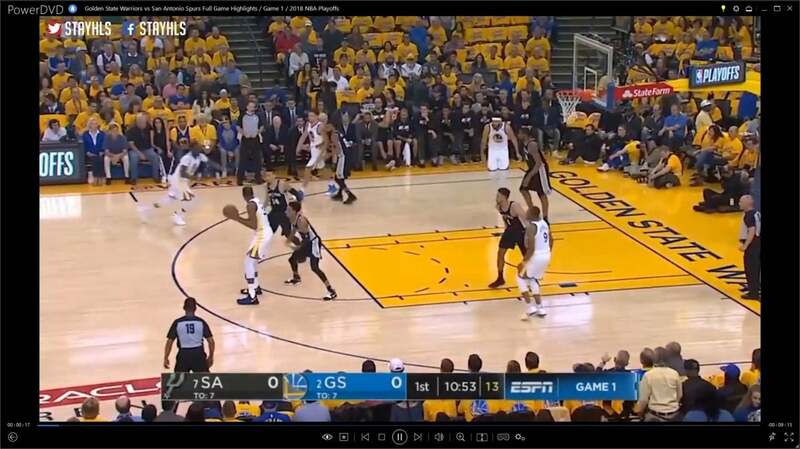 While you can find similar, if harder-to-use, tweaks in the free players, there’s nothing that I’m aware of that compares to the motion compensation or shaky video stabilizer PowerDVD offers. I’m sure I’ll hear from you if there is. I also use PowerDVD to browse for videos on YouTube rather than fire up a web browser. Being able to “pin” the videos (i.e., downloading them for offline viewing) is very handy. Now for some mildly bad news that might affect some users until Cyberlink fixes the bug. I was unable to hear the audio track on many videos while using my external Focusrite Scarlett Solo (gen 2) USB audio interface. Some audio tracks played, some rendered in such codecs as AAC (LC) would not. Oddly, all the video soundtracks played when I switched to the onboard integrated audio. Annoyingly, PowerDVD insisted on continuing to use said internal interface even when I switched the system default back to the Scarlett. I’m sure Cyberlink will figure it out, but it is a strange and disconcerting behavior from such a mature program. If you already own PowerDVD 17, then this is an upgrade you can skip or purchase as the new features appeal to you. I don’t consider it a must-buy, but I don’t have any true need of any of the new features. If you’re on the $45 yearly (or $15 every three months) subscription plan, just enjoy the improvement to what was already the best video player on the planet. If you don’t own the program, and want the very best video playback for your Windows PC, then PowerDVD is a purchase well worth considering.